If you are in the business of piloting development policies with NGOs, this chart should be keeping you awake at night. If you like to think about "sustainability" and "scale", about handing over your activities to the government, you need to be really really worried. Researchers persuaded World Vision and local government in Kenya to both implement that exact same intervention at the same time. The program as implemented by World Vision found a large impact on test scores. The exact same program, as implemented by the local government, found zero impact. For more see Gabriel Demombynes. Evaluation skeptics may try to cite this as evidence that RCTs are a waste of time, since it suggests that successful interventions implemented by NGOs, as they often are in experiments, may not be replicated at scale by governments. Others might take the paper to indicate that NGOs should be the preferred vehicle for interventions. I think these readings would be mistaken, and I take two reflections from the paper. First, we should do many more rigorous studies working with governments where we vary forms of service delivery to better understand what can work in practice. Second, the World Bank’s approach to public services—the long, difficult slog of working to improve government systems—is the right one, because it’s the only way to ultimately make services work for the poor at large scale. I agree. Clearly working through government systems is essential. 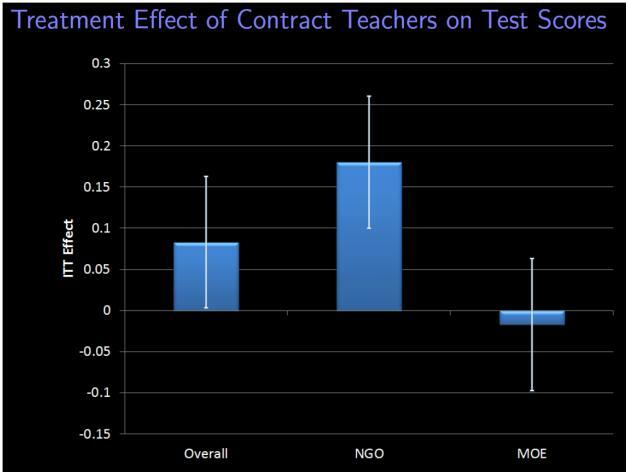 Innovations for Poverty Action are doing just this - scaling up the exact same contract teacher program tested with NGOs in Kenya and India, but doing it with the government in Ghana, and doing an RCT as they go. full paper for the truly interested reader. to see more RCTs in development. this point has ceased to exist. to make the contract teacher program happen and evaluate it rigorously, and who have been unflinching about not hiding bad results as they came in. Thanks Justin, I agree entirely that the people from the Ministry of Education who were involved in making this trial happen deserve enormous credit. Thanks much! I have tried to ask a few different questions over here (http://hlanthorn.com/2012/04/15/experimenting-with-intention/) if you are interested. I don't actually offer any insightful answers. - how involved should the putative implementer be in the design & conduct of the experiment?- how much training and capacity building with the future implementer should be built into the experimental process? would we start to consider ethical requirements in this regard (i.e. experimenters have some obligation to train as well, as needed)?- if something doesn't work, what responsibility do we have to help enhance the public sector's (or other implementer's) capacity? i.e. is the response to a null finding a scrapping of the idea or a re-tooling of the implementer? or something else? bit, however other than that, this is wonderful blog. An excellent read.